We are so glad you have decided to join the pride of La Mesa and become part of the ongoing history of excellence. 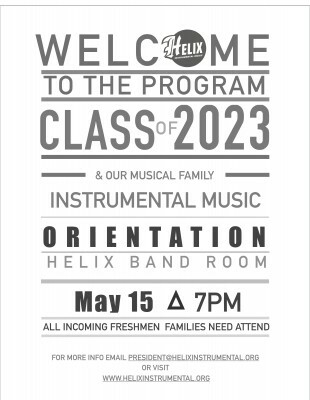 The Helix Instrumental Music Program has a rich history within the community and has graduated some very impressive alumni. We are so excited and look forward to seeing where you help take the program these next four years! Students and families, we encourage you to come to our meeting to learn how to get plugged in and get involved! The meeting will take place in the Helix performing arts center at 7:00pm. We will give a short presentation and overview of the program. will also have a question and answer session as well. We look forward to seeing you there.